Continuing on with my salad how-to, the next part is about the different kind of salad greens available, and a general idea on how they taste (mild, bitter, spicy) & look. Lettuce is the most salad green available, however, it does tend to have a one-dimensional taste. 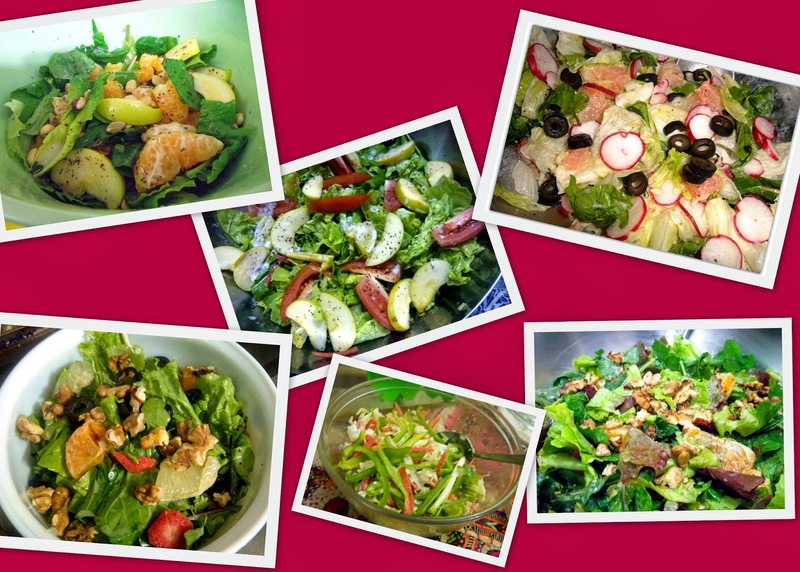 Hence, the best kind of salad is made with a mixture of different salad greens which complement each other. My personal favourite is to either use a bag of mesclun lettuce (mixture of salad greens) and then add fruits or other ingredients as per my taste. Alternatively, I use one type of lettuce as the base of my salad and then I add some baby spinach and rocket for contrast. Once again I will quote myself 'it's your house and you can adjust as much as you want to!'. Taste the vegetables, then start on making the salad, and keep on getting feedback from your family till you figure out the balance. Do remember that the addition of salt & dressing dramatically changes the flavor of the green, so taste raw, then add dressing and taste again. For example, I found rocket/arugula to be quite spicy, but it provides a wonderful contrast to mild tasting lettuce. On the other hand, ice-berg lettuce tastes great when eaten raw because of its mild flavor, but when its mixed in a salad, it falls flat unless you add some spicy greens for contrast. I know that it is quite easy to find the majority of salad greens mentioned below abroad, be it through supermarkets or farmer markets, but this is not so simple in Karachi. I have posted a few resources below on finding salad greens locally. Rocket/Arugula: Leaves are dark green and tender, with the taste being peppery and slightly bitter. Butterhead (or Boston/Bib) Lettuce: Mild-tasting round-shaped lettuce with extremely tender leaves. Cabbage: Available in green and red (aka purple cabbage) varieties with crisp & crunchy leaves and bitter and sharp taste. Chard/Swiss Chard: Large, deep green leaves which are always cooked before eating. Dandelion Greens: Leaves are tender, with the shape being long and having jagged edges – young leaves can be used in salads but the older ones need should be cooked before eating. The flavor is bitter and similar to rocket. Belgian Endive: The endive has a smooth oval shape, with the yellow tips having a mild flavor and the white thick leaf bases being crisp but tasting bitter. The spoon like shape makes them great for dips and stuffing. Escarole: Mild tasting green with wide & frilly leaves that are good for adding volume & texture to salads. Frisee: Usually having green leaves, which can sometimes be edged in red, which are long & curly. The taste is slightly peppery. Kale: Kale has become quite a popular vegetable recently due to its health benefits, and its many uses ranging from kale chips to steamed kale to chopped up kale in salads. It is part of the cabbage family & has a similar taste, with two common varieties – kale having smooth leaves, and curly kale with crinkly leaves. The leaves themselves are broad & ruffled, and range from deep green to purple. Iceberg Lettuce: One of the most common types of lettuce available, with tender & pale green leaves. The taste is mild & crunchy, making it great for both salads and for use to wrap as a container for fillings. Looseleaf Lettuce: Red leaf & green are the most common varieties, available in a large rosette shape with ruffled leaves. Texture is crunchy with a mild taste. Mesclun Lettuce: Mesclun comes from the French word for mixture and is used for a mix of salad greens, herbs & even edible flowers at times. These are available pre-mixed in bags, or if someone loves to garden can easily be made at home. The taste of the mix depends on the assortment of greens, but it’s usually a mix of mild & peppery for the best flavor. The best part about using it is that you can just open a pack of greens, toss it in some dressing and the salad is ready. Radicchio: Radicchio has quite a peppery taste, however, the crisp deep red/almost purple tinged with white leaves provides a beautiful contrast to any salad. Romaine Lettuce: The primary ingredient of a Ceasar salad, it has long green crunchy leaves. It has a slightly bitter taste which needs a creamy dressing to compliment it. Spinach/Baby Spinach: While spinach is most often cooked, it can also be used in salads. The leaves are tender, dark green with the taste being slightly bitter. Generally, baby spinach and/or flat leaf spinach varieties are preferred for salads because the leaves are more tender & also sweeter.